The wrong pop-up book can give you nightmares, but the right one can entertain and enlighten. A designer by the name of Kelli Andeson is working on a pop-up book which pushes the boundaries of the genre. 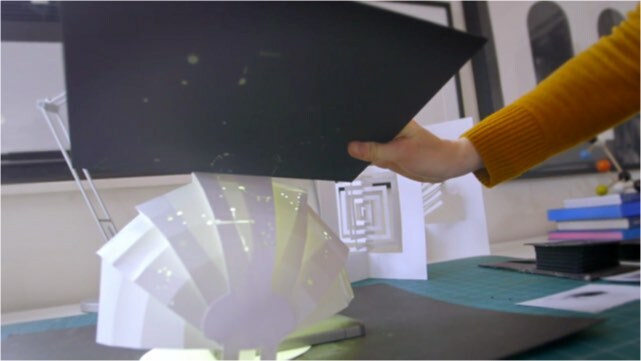 Due out in October, This Book Is a Planetarium: And Other Extraordinary Pop-Up Contraptions turns a book into things which you wouldn't believe possible, including a planetarium, a musical instrument, a speaker for your smartphone, and more. Just about all of the ideas in that book can and have already been done with apps, but there's something to be said for manipulating the physical object and watching the planetarium, for example, fill an entire room. It expands beyond the square foot or so taken up by the open book in a way that no app can, and I like how that adds to the experience.